If you are looking for a strong windproof walking umbrella, the Best umbrella for men, one that would fit into your status and still be very useful in shielding you from rains, wind and even the storm. This walking umbrella is priced on the higher end of the umbrella market at £44.99, but it does offer you a lot more than just keeping you dry. The shaft of the Mens Consul walking umbrella is made from steel with an 8 ribbed frame, so you don’t want to worry about this umbrella blowing inside out during the rain. It has been polished out with a Malacca handle which is a design feature based on style. The idea behind it is that this walking mens umbrella is meant to add style and sophisticated during your walk. Like all windproof umbrella that material used for this umbrella is no different, 100% polyester, light and durable. 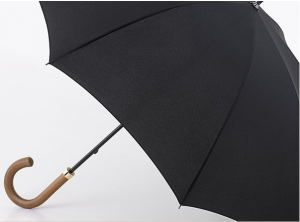 The mens consul walking umbrella comes in one colour only, which is black. I myself own this umbrella and have done for the past 5 months, sadly I use too much more then id like too because of the English weather, but as design and build goes, I would say it’s the best umbrella I have ever owned. When suit it comes in about 90cm, which gives room to use it as a walking stick when its not raining, it’s a nice piece of kit, in both style and usefulness. The Mens consul Umbrella does what a umbrella needs to do, which is keeping you dry. However this one gives you the added benefit of style, which is hard to find these days in a mens umbrella, which is why I like it so much. If could be slightly small to get more than 2 people under it, but don’t worry, this will keep you dry and stylish through any British weather. This is the best umbrella for men on the market, well…for stylish men anyway.